It’s always fun waiting for the latest and greatest tech toys to come out. However, it’s just cruel when they post ‘Coming Soon’ or anything along those lines. Then there really is no way to know when it will finally come out. This Voltaic Generator is one that was supposed to be coming for a while now, considering it was announced at CES way back in January. 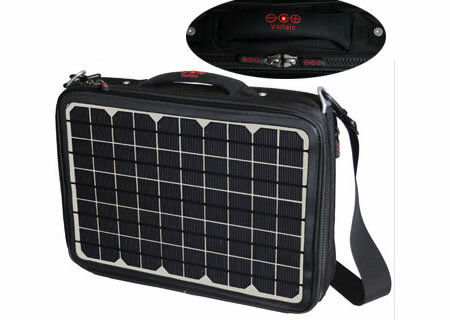 Although the Voltaic bag is just another solar powered bag, it does have one extra that isn’t always featured. The materials used are actually environmentally conscious. The bag is made of recycled PET bottles or soda bottles. According to the site it also uses a solar cell supplier that has higher efficiency cells which in turn gives a faster charging time. It turns out, that solar cell supplier is the reason for the delays in releasing the bag. Although the bag itself isn’t new news, someone actually managed to find the site that was selling it and give it a price tag. However, sadly it states that it will be released in the spring of this year. Obviously, since it is well past then, there is no way to know when it will finally be released. Once it does it will be sold for $599 and it can hold up to a 17″ laptop. Is there really a market for this kind of product? Most laptops are already heavy enough, the bag itself seems to add some weight to this “portable” laptop business. Then, when someone would use it? Personally I take my laptop fully charged before I go anywhere with it. So far, in all destinations I was able to recharge it (fully) before the next one. Maybe in a park or garden? Just to slow down the battery draining speed. But then, from my experience, most laptopss screen have some serious issue with sun glare.